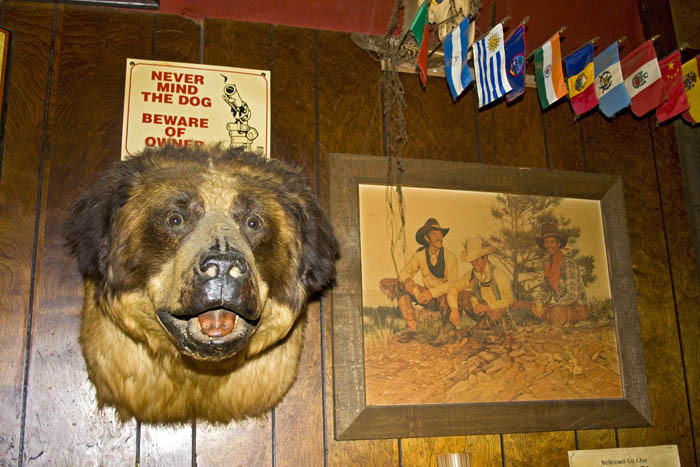 Caption: Head of former pet dog hangs on wall of Shooting Star Saloon in Huntsville, Utah. Comments: Head of former pet dog hangs on wall of Shooting Star Saloon in Huntsville, Utah. This is reportedly the oldest continuously running saloon in Utah. It's famous for its Shooting Star Burger (two beef patties and a sausage, plus more), its stuffed trophy heads on the walls (moose, coyote and the former pet St. Bernard dog) and the signed dollar bills on the ceiling. It is also reputedly the most heavily insured bar in the state.